Arteriovenous Malformation: Can Treatment Help? What are the symptoms of arteriovenous malformations? How do arteriovenous malformations damage the brain and spinal cord? Where do neurological arteriovenous malformations tend to form? What are the health consequences of arteriovenous malformations? What other types of vascular lesions affect the central nervous system? How are arteriovenous malformations and other vascular lesions detected? How can arteriovenous malformations and other vascular lesions be treated? Arteriovenous malformations (AVMs) are defects of the circulatory system that are generally believed to arise during embryonic or fetal development or soon after birth. They are comprised of snarled tangles of arteries and veins. Arteries carry oxygen-rich blood away from the heart to the body's cells; veins return oxygen-depleted blood to the lungs and heart. The absence of capillaries -- small blood vessels that connect arteries to veins -- creates a short-cut for blood to pass directly from arteries to veins. The presence of an AVM disrupts this vital cyclical process. Although AVMs can develop in many different sites, those located in the brain or spinal cord -- the two parts of the central nervous system -- can have especially widespread effects on the body. What Are the Symptoms of AVMs? Seizures and headaches are the most generalized symptoms of AVMs, but no particular type of seizure or headache pattern has been identified. Seizures can be partial or total, involving a loss of control over movement, convulsions, or a change in a person's level of consciousness. Headaches can vary greatly in frequency, duration, and intensity, sometimes becoming as severe as migraines. Sometimes a headache consistently affecting one side of the head may be closely linked to the site of an AVM. More frequently, however, the location of the pain is not specific to the lesion and may encompass most of the head. One of the more distinctive signs indicating the presence of an AVM is an auditory phenomenon called a bruit, coined from the French word meaning noise. (A sign is a physical effect observable by a physician, but not by a patient.) Doctors use this term to describe the rhythmic, whooshing sound caused by excessively rapid blood flow through the arteries and veins of an AVM. The sound is similar to that made by a torrent of water rushing through a narrow pipe. A bruit can sometimes become a symptom when it is especially severe. When audible to individuals, the bruit may compromise hearing, disturb sleep, or cause significant psychological distress. AVMs compromise oxygen delivery to the brain or spinal cord by altering normal patterns of blood flow. Arteries and veins are normally interconnected by a series of progressively smaller blood vessels that control and slow the rate of blood flow. Oxygen delivery to surrounding tissues takes place through the thin, porous walls of the smallest of these interconnecting vessels, known as capillaries, where the blood flows most slowly. The arteries and veins that make up AVMs, however, lack this intervening capillary network. Instead, arteries dump blood directly into veins through a passageway called a fistula. The flow rate is uncontrolled and extremely rapid -- too rapid to allow oxygen to be dispersed to surrounding tissues. When starved of normal amounts of oxygen, the cells that make up these tissues begin to deteriorate, sometimes dying off completely. This abnormally rapid rate of blood flow frequently causes blood pressure inside the vessels located in the central portion of an AVM directly adjacent to the fistula—an area doctors refer to as the nidus, from the Latin word for nest -- to rise to dangerously high levels. The arteries feeding blood into the AVM often become swollen and distorted; the veins that drain blood away from it often become abnormally constricted (a condition called stenosis). Moreover, the walls of the involved arteries and veins are often abnormally thin and weak. Aneurysms -- balloon-like bulges in blood vessel walls that are susceptible to rupture -- may develop in association with approximately half of all neurological AVMs due to this structural weakness. Even in the absence of bleeding or significant oxygen depletion, large AVMs can damage the brain or spinal cord simply by their presence. They can range in size from a fraction of an inch to more than 2.5 inches in diameter, depending on the number and size of the blood vessels making up the lesion. The larger the lesion, the greater the amount of pressure it exerts on surrounding brain or spinal cord structures. The largest lesions may compress several inches of the spinal cord or distort the shape of an entire hemisphere of the brain. Such massive AVMs can constrict the flow of cerebrospinal fluid - a clear liquid that normally nourishes and protects the brain and spinal cord -- by distorting or closing the passageways and open chambers (ventricles) inside the brain that allow this fluid to circulate freely. As cerebrospinal fluid accumulates, hydrocephalus results. This fluid buildup further increases the amount of pressure on fragile neurological structures, adding to the damage caused by the AVM itself. AVMs can form virtually anywhere in the brain or spinal cord -- wherever arteries and veins exist. Some are formed from blood vessels located in the dura mater or in the pia mater, the outermost and innermost, respectively, of the three membranes surrounding the brain and spinal cord. (The third membrane, called the arachnoid, lacks blood vessels.) AVMs affecting the spinal cord are of two types, AVMs of the dura mater, which affect the function of the spinal cord by transmitting excess pressure to the venous system of the spinal cord, and AVMs of the spinal cord itself, which affect the function of the spinal cord by hemorrhage, by reducing blood flow to the spinal cord, or by causing excess venous pressure. Spinal AVMs frequently cause attacks of sudden, severe back pain, often concentrated at the roots of nerve fibers where they exit the vertebrae; the pain is similar to that caused by a slipped disk. These lesions also can cause sensory disturbances, muscle weakness, or paralysis in the parts of the body served by the spinal cord or the damaged nerve fibers. Spinal cord injury by the AVM by either of the mechanisms described above can lead to degeneration of the nerve fibers within the spinal cord below the level of the lesion, causing widespread paralysis in parts of the body controlled by those nerve fibers. Dural and pial AVMs can appear anywhere on the surface of the brain. Those located on the surface of the cerebral hemispheres -- the uppermost portions of the brain—exert pressure on the cerebral cortex, the brain's "gray matter." Depending on their location, these AVMs may damage portions of the cerebral cortex involved with thinking, speaking, understanding language, hearing, taste, touch, or initiating and controlling voluntary movements. AVMs located on the frontal lobe close to the optic nerve or on the occipital lobe, the rear portion of the cerebrum where images are processed, may cause a variety of visual disturbances. Besides AVMs, three other main types of vascular lesion can arise in the brain or spinal cord: cavernous malformations, capillary telangiectases, and venous malformations. These lesions may form virtually anywhere within the central nervous system, but unlike AVMs, they are not caused by high-velocity blood flow from arteries into veins. In contrast, cavernous malformations, telangiectases, and venous malformations are all low-flow lesions. Instead of a combination of arteries and veins, each one involves only one type of blood vessel. These lesions are less unstable than AVMs and do not pose the same relatively high risk of significant hemorrhage. In general, low-flow lesions tend to cause fewer troubling neurological symptoms and require less aggressive treatment than do AVMs. Cavernous malformations. These lesions are formed from groups of tightly packed, abnormally thin-walled, small blood vessels that displace normal neurological tissue in the brain or spinal cord. The vessels are filled with slow-moving or stagnant blood that is usually clotted or in a state of decomposition. Like AVMs, cavernous malformations can range in size from a few fractions of an inch to several inches in diameter, depending on the number of blood vessels involved. Some people develop multiple lesions. Although cavernous malformations usually do not hemorrhage as severely as AVMs do, they sometimes leak blood into surrounding neurological tissues because the walls of the involved blood vessels are extremely fragile. Although they are often not as symptomatic as AVMs, cavernous malformations can cause seizures in some people. After AVMs, cavernous malformations are the type of vascular lesion most likely to require treatment. Capillary telangiectases. These lesions consist of groups of abnormally swollen capillaries and usually measure less than an inch in diameter. Capillaries are the smallest of all blood vessels, with diameters smaller than that of a human hair; they have the capacity to transport only small quantities of blood, and blood flows through these vessels very slowly. Because of these factors, telangiectases rarely cause extensive damage to surrounding brain or spinal cord tissues. Any isolated hemorrhages that occur are microscopic in size. Thus, the lesions are usually benign. 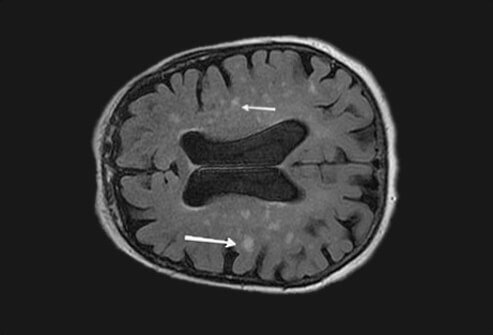 However, in some inherited disorders in which people develop large numbers of these lesions (see below), telangiectases can contribute to the development of nonspecific neurological symptoms such as headaches or seizures. Venous malformations. These lesions consist of abnormally enlarged veins. The structural defect usually does not interfere with the function of the blood vessels, which is to drain oxygen-depleted blood away from the body's tissues and return it to the lungs and heart. Venous malformations rarely hemorrhage. As with telangiectases, most venous malformations do not produce symptoms, remain undetected, and follow a benign course. Although the cause of these vascular anomalies of the central nervous system is not yet well understood, scientists believe that they most often result from mistakes that occur during embryonic or fetal development. These mistakes may be linked to genetic mutations in some cases. A few types of vascular malformations are known to be hereditary and thus are known to have a genetic basis. Some evidence also suggests that at least some of these lesions are acquired later in life as a result of injury to the central nervous system. During fetal development, new blood vessels continuously form and then disappear as the human body changes and grows. These changes in the body's vascular map continue after birth and are controlled by angiogenic factors, chemicals produced by the body that stimulate new blood vessel formation and growth. Researchers have recently identified changes in the chemical structures of various angiogenic factors in some people who have AVMs or other vascular abnormalities of the central nervous system. However, it is not yet clear how these chemical changes actually cause changes in blood vessel structure. By studying patterns of familial occurrence, researchers have established that one type of cavernous malformation involving multiple lesion formation is caused by a genetic mutation in chromosome 7. This genetic mutation appears in many ethnic groups, but it is especially frequent in a large population of Hispanic Americans living in the Southwest; these individuals share a common ancestor in whom the genetic change occurred. Some other types of vascular defects of the central nervous system are part of larger medical syndromes known to be hereditary. They include hereditary hemorrhagic telangiectasia (also known as Osler-Weber-Rendu disease), Sturge-Weber syndrome, Klippel-Trenaunay syndrome, Parkes-Weber syndrome, and Wyburn-Mason syndrome. How Are AVMs and Other Vascular Lesions Detected? Physicians now use an array of traditional and new imaging technologies to uncover the presence of AVMs. Angiography provides the most accurate pictures of blood vessel structure in AVMs. The technique requires injecting a special water-soluble dye, called a contrast agent, into an artery. The dye highlights the structure of blood vessels so that it can be recorded on conventional X-rays. Although angiography can record fine details of vascular lesions, the procedure is somewhat invasive and carries a slight risk of causing a stroke. Its safety, however, has recently been improved through the development of more precise techniques for delivering dye to the site of an AVM. Superselective angiography involves inserting a thin, flexible tube called a catheter into an artery; a physician guides the tip of the catheter to the site of the lesion and then releases a small amount of contrast agent directly into the lesion. Two of the most frequently employed noninvasive imaging technologies used to detect AVMs are computed axial tomography (CT) and magnetic resonance imaging (MRI) scans. CT scans use X-rays to create a series of cross-sectional images of the head, brain, or spinal cord and are especially useful in revealing the presence of hemorrhage. MRI imaging, however, offers superior diagnostic information by using magnetic fields to detect subtle changes in neurological tissues. A recently developed application of MRI technology -- magnetic resonance angiography (MRA) -- can record the pattern and velocity of blood flow through vascular lesions as well as the flow of cerebrospinal fluid throughout the brain and spinal cord. CT, MRI, and MRA can provide three-dimensional representations of AVMs by taking images from multiple angles. How Can AVMs and Other Vascular Lesions Be Treated? Medication can often alleviate general symptoms such as headache, back pain, and seizures caused by AVMs and other vascular lesions. However, the definitive treatment for AVMs is either surgery or focused irradiation therapy. Venous malformations and capillary telangiectases rarely require surgery; moreover, their structures are diffuse and usually not suitable for surgical correction and they usually do not require treatment anyway. Cavernous malformations are usually well defined enough for surgical removal, but surgery on these lesions is less common than for AVMs because they do not pose the same risk of hemorrhage. The decision to perform surgery on any individual with an AVM requires a careful consideration of possible benefits versus risks. The natural history of an individual AVM is difficult to predict; however, left untreated, they have the potential of causing significant hemorrhage, which may result in serious neurological deficits or death. On the other hand, surgery on any part of the central nervous system carries its own risks as well; AVM surgery is associated with an estimated 8 percent risk of serious complications or death. There is no easy formula that can allow physicians and their patients to reach a decision on the best course of therapy -- all therapeutic decisions must be made on a case-by-case basis. Today, three surgical options exist for the treatment of AVMs: conventional surgery, endovascular embolization, and radiosurgery. The choice of treatment depends largely on the size and location of an AVM. Conventional surgery involves entering the brain or spinal cord and removing the central portion of the AVM, including the fistula, while causing as little damage as possible to surrounding neurological structures. This surgery is most appropriate when an AVM is located in a superficial portion of the brain or spinal cord and is relatively small in size. AVMs located deep inside the brain generally cannot be approached through conventional surgical techniques because there is too great a possibility that functionally important brain tissue will be damaged or destroyed. Endovascular embolization and radiosurgery are less invasive than conventional surgery and offer safer treatment options for some AVMs located deep inside the brain. In endovascular embolization the surgeon guides a catheter though the arterial network until the tip reaches the site of the AVM. The surgeon then introduces a substance that will plug the fistula, correcting the abnormal pattern of blood flow. This process is known as embolization because it causes an embolus (an object or substance) to travel through blood vessels, eventually becoming lodged in a vessel and obstructing blood flow. The embolic materials used to create an artificial blood clot in the center of an AVM include fast-drying biologically inert glues, fibered titanium coils, and tiny balloons. Since embolization usually does not permanently obliterate the AVM, it is usually used as an adjunct to surgery or to radiosurgery to reduce the blood flow through the AVM and make the surgery safer. Radiosurgery is an even less invasive therapeutic approach. It involves aiming a beam of highly focused radiation directly on the AVM. The high dose of radiation damages the walls of the blood vessels making up the lesion. Over the course of the next several months, the irradiated vessels gradually degenerate and eventually close, leading to the resolution of the AVM. Embolization frequently proves incomplete or temporary, although in recent years new embolization materials have led to improved results. Radiosurgery often has incomplete results as well, particularly when an AVM is large, and it poses the additional risk of radiation damage to surrounding normal tissues. Moreover, even when successful, complete closure of an AVM takes place over the course of many months following radiosurgery. During that period, the risk of hemorrhage is still present. However, both techniques now offer the possibility of treating deeply situated AVMs that had previously been inaccessible. And in many individuals, staged embolization followed by conventional surgical removal or by radiosurgery is now performed, resulting in further reductions in mortality and complication rates. Because so many variables are involved in treating AVMs, doctors must assess the danger posed to individuals largely on a case-by-case basis. The consequences of hemorrhage are potentially disastrous, leading many clinicians to recommend surgical intervention whenever the physical characteristics of an AVM appear to indicate a greater-than-usual likelihood of significant bleeding and resultant neurological damage. Within the Federal government, the National Institute of Neurological Disorders and Stroke (NINDS), a division of the National Institutes of Health (NIH), has primary responsibility for sponsoring research on neurological disorders. As part of its mission, the NINDS conducts research on AVMs and other vascular lesions of the central nervous system and supports studies through grants to major medical institutions across the country. In partnership with the medical school of Columbia University, the NINDS has established a long-term Arteriovenous Study Group to learn more about the natural course of AVMs in patients and to improve the surgical treatment of these lesions. Another group of NINDS-sponsored researchers is currently studying large populations of patients with AVMs to formulate criteria that will allow doctors to predict more accurately the risk of hemorrhage in individual patients. Of particular importance is the role that high blood pressure within the lesion plays in the onset of hemorrhage. Other scientists are examining the genetic basis of familial cavernous malformations and other hereditary syndromes that cause neurological vascular lesions, including ataxia telangiectasia. Other scientists are seeking to refine the techniques now available to treat AVMs. Radiosurgery is a special area of interest because this technology is still in its infancy. An ongoing study is closely examining the precise effects that radiation exposure has on vascular tissue in order to improve the predictability and consistency of treatment results. Finally, several ongoing studies are devoted to developing new noninvasive neuroimaging technologies to increase the effectiveness and safety of AVM surgery. Some scientists are pioneering the use of MRI to measure amounts of oxygen present in the brain tissue of patients with vascular lesions in order to predict the brain's response to surgical therapies. Others are developing a new micro-imager that may be inserted into catheters to increase the accuracy of angiography. 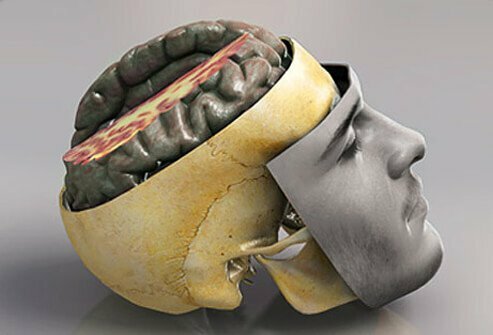 In addition, new types of noninvasive imaging devices are being developed that detect functional brain activity through changes in tissue light emission or reflectance. This technology may prove more sensitive than MRI and other imaging devices currently available, giving surgeons a new tool for improving the efficacy and safety of AVM surgery. "Arteriovenous Malformations and Other Vascular Lesions of the Central Nervous System Fact Sheet." National Institute of Neurological Disorders and Stroke. 4 Feb. 2013.